In the first decision of its kind in Belgium, a Ghent court has ruled in favour of two Muslim women who filed a complaint against two public swimming pools for not allowing them to wear ‘burkinis’. From 1 September, the two pools – and all other public pools in Ghent and Merelbeke – must allow women to wear burkinis, or full-body swimming costumes. Both swimming pools – one in Ghent and one in neighbouring Merelbeke – had regulations that banned the wearing of burkinis along with shorts or T-shirts in the water, citing hygiene reasons. The court ruled against the pools, saying the inclusion of burkinis in the ban was discrimination. The court cited documentation gathered on the subject, including a study by the Flemish Care and Health Agency. This is the first such decision in Belgium, though it does not apply to the entire region, only to Ghent and Merelbeke. The swimming pools much adapt their regulations accordingly, even if they decide to appeal the decision. The City of Ghent, in fact, is going to appeal the decision – because they feel it does not go far enough. “The city council feels that the verdict is too limited because it specifically points to religion and philosophy as the only exception,” the council said in a press statement. City councillor for sport Resul Tapmaz (S.PA) later told De Standaard: “If it has no impact on hygiene, then that has nothing to do with religion.” He said that anyone should be able to cover their bodies, whether it’s because of a skin condition, scars, being transgender or any other reason. All of Antwerp’s public swimming pools follows the city’s regulations, which don’t mention the burkini by name. They say only that women must wear “a swimsuit or bikini” that is “made from a material specifically designed for swimming”. Jump into a river or lake, with even just your pants on...and then you will see just how truly dangerous this muslim swimsuit is. 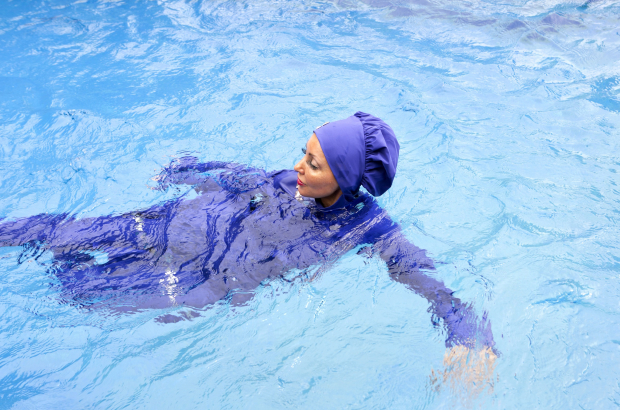 Have separate swimming pools only for those that only decide to wear a burkini. Not easy to resuscitate a person dressed in a burkini.